▷ Best Men highlights 2019 ¡Photo ideas & step by step! 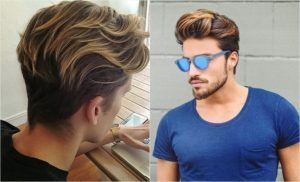 Against most people believes, highlights are actually not only for girls but guys are also joining this awesome trend and having their hair highlighted. 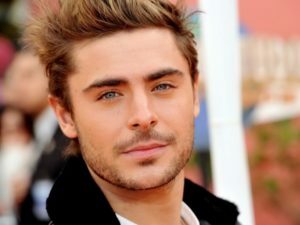 Men look amazingly with highlights, either they have them be very subtle or very notorious they look like super stars! It is like a flashback, in the 90’s the men highlights were the most used and notorious men trend of the year and we can all agree that those were not the best look for anyone, but now things have changed and men highlights are done the correct way and don’t look so awkward. 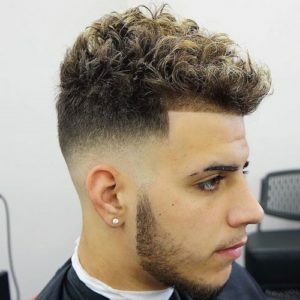 If you are a guy and want a change of look but don’t really want to cut your hair or anything of the sorts, then highlighting your hair can be the perfect solution for you! 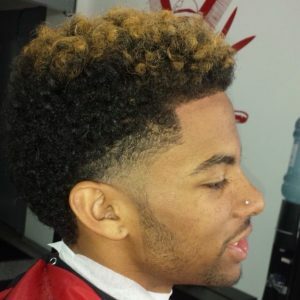 Men highlights are a trend contrasting with the last men hair trends, like the gray and platinum hair, that were very bold and attention demanding and highlights have come for men to loosen up and to relax with this less demanding hair style. Men highlights fashion have endured a long way and maturing so now you have looks to enhance your beauty, not define it, but enhance it. Subtle well executed highlights are making a comeback but with new and better ground rules. Speak to a professional: First thing first, booking an appointment and speak to a professional who understands what your hair type, your needs and your options are so they can help you have the best results that you could have. Know your needs: Adding highlights is used to enhance the depth and texture of your hair so when it catches the sun light it has more vitality and what works best with light, thin hair may not work the same for someone with darker and thicker hair. So before you go to your hair stylist take some time to do some research and find a few celebrities or style icons with hair similar to yours and the highlights that you want and get the conversation started. Think long term: To take care of your highlights for them to last longer, you need to use the right shampoo and hair products to protect your hair and preserve the color. Doing this will keep your hair with a natural look and feel after the rough process you have made it go through that usually causes dryness. Highlighting your hair gives it a great boost and enhancement, their benefits can range from heightened texture and depth to more visible movement creating an overall illusion of fullness. The reason why most people do not dye their hair is the fear of damaging it, and while it is true that dyeing your hair can damage it and there is not really a way to avoid it does not mean you should not try to do it. All you have to do is to proceed with caution at the time of lightening your hair, and we recommend for you to trust your hair on the knowing hands of your hair stylist as they are the ones that know what can help and work better in your hair. Going for highlights is the best choice for you is you are looking for a subtle change of look, they will add vitality and more depth to it. You just need to make a decision and take the risk to highlight your hair. 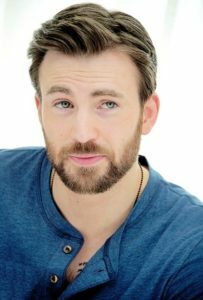 Men highlights are not very common but we assure you that you will look amazing with them. All you have to do is going to your hairstylist and ask for what you want and you’ll have them, but be stay open to what your stylist recommends as they are the ones that know best. 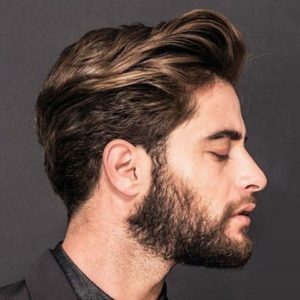 What are the best techniques to apply men highlights? 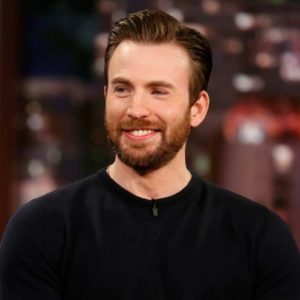 Cap highlighting can be your best option to apply your men highlights to the hair, as it is most likely sure applying them with highlights it is going to be a difficult task but with the cap it is only a matter of care and time. You are not going to look fabulous during the process, but we promise you, the results are going to be amazing. A balayage technique, although complicated, can be done as well. 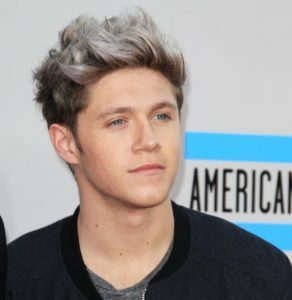 In the men highlights world this technique can also be found as frosted tips, as that is how it will look in the end. This look is trendy, and applied with a gradient from the natural hair color at the roots and then the bleach that keeps getting stronger the closer it gets to the tips. This way the color will look natural and vibrant. 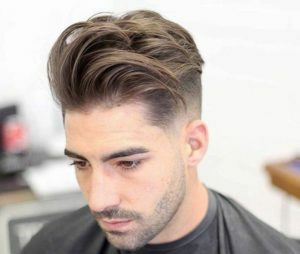 With short men hair you can also try to apply foiled highlights but they are going to be a very difficult task to do specially if your hair is shorter than 2 or 3 inches then you should try any of the other techniques. Now if you have longer hair then foiled highlights may be for you! Just take a little time to investigate about each technique before proceeding to dye your hair. Keep in mind that the best shades for your skin tone and hair color can be a little difficult to find, as you have to find a color that makes a balance between these two things. Also take into consideration the under tones, if you are a folk with warm skin then having warm men highlights is what you should do, but if you have a cool toned skin the stick to cool toned men highlights to ensure the best look on you. Blonde highlights have been such a trend for such a long time that they can surely be considered just like a good black dress, classy and can work in every occasion either formal or casual. Blonde highlights are so easy to match with any hair color that you can be sure that they are going to look good on you no matter what hair color you have. So be sure that what you want is this color and you will have a great time with them. Having such a light hair like blonde, finding a highlight could end up being a really hard task to do, but then you could try with low lights, that are essentially highlights but with a twist, the shades you will be applying are darker than the base color so your base color acts like the highlights. Brown has such a big arrange of shades and colors by itself that finding a highlight tone that works perfectly with it can be an easy and very difficult task at the same time. Remember to not be shy and go and ask your stylist what would work best for you! They are the ones that know best. With light brown hair, trying blonde men highlights can give you an impressive look at the same time as lightening your hair and face! Some light brown highlights can give you a more natural and subtle look when applied, but will also highlight your entire look especially when you are standing under de direct sun light. 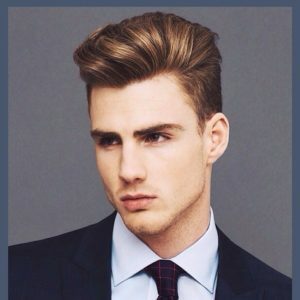 For darker brown hair the best option for you is to add tone on tone men highlights, in short they are a highlighting technique that uses various shades of a color and applies them to different strand of hair to add vibrancy and depth to your hair. But it does not end there! Golden men highlights can create a stunning contrast with your natural dark hair and give you a quick and easy change of look. 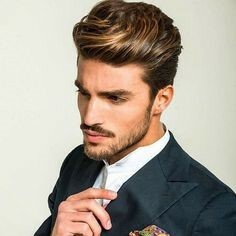 And if you are not afraid of color, then try to add some rose gold highlights, that are technically a light brown shade of brown tinted with rose that can add a bit of fun and color to your men highlights. 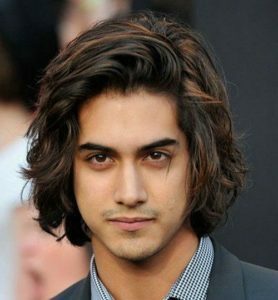 Adding some lights and movement to your black hair can be very easy when adding men highlights to it. You just have to make sure that your stylist knows how to work with your hair to give it the best results you could think about. If you do not know what shades work the best with your hair, then here we are to help you with that! Here are some that we swear by. If what you are looking for is a subtler look then brown highlights are what you should be looking for, they are going to give you the sun kissed look you want, and also add dimension and depth to the hair. 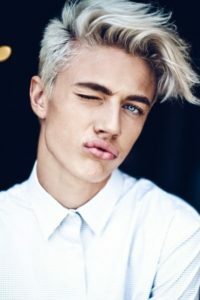 For a bolder and more notorious look blonde men highlights can be a perfect addition to your hair, the will add a contrast from your dark natural air to the lightness of the blonde you have applied. A little secret we want to tell you is that there is no color that will look bad on black hair, so you can have complete freedom when choosing what color you want to dye your locks. Meaning that you can add some muted fantasy colored highlights on your black hair and it will give it a subtle change of look, which will completely pop out when under direct sun light. 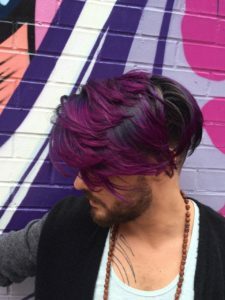 At the moment of dyeing your hair the most important thing before you even try to do it is to investigate all the different options of men highlights techniques so you can see the plenty of options that are available for you and your hair. This also works as a way to have an idea of how the end result is going to end looking in you, especially if you find a celebrity of fashion icon that has a hair that is alike yours. Applying dye to the hair can be a very stressful process for it, as the dye breaks the structure of the hair to remove its color, so it is important for you to take care of your hair to keep it healthy and good looking. The first thing that we recommend is for you to change up your care daily routines and wash your hair less times a week, excessive washing can also lead to dryness of the hair, so washing your hair 2 or 3 times a week is the ideal times period. Also, you should never miss applying conditioner to maintain your hair hydrated and with more life. Using oils can be a very good solution as well, just add a few drops of it on your scalp once a week at least 30 minutes before washing your hair so it has time to be absorbed by your hair and skin. Oils that have plenty of nutrients that can help you moisturize your hair and maintain your hair good and shiny are jojoba oil, coconut oil, argan oil and even olive oil!